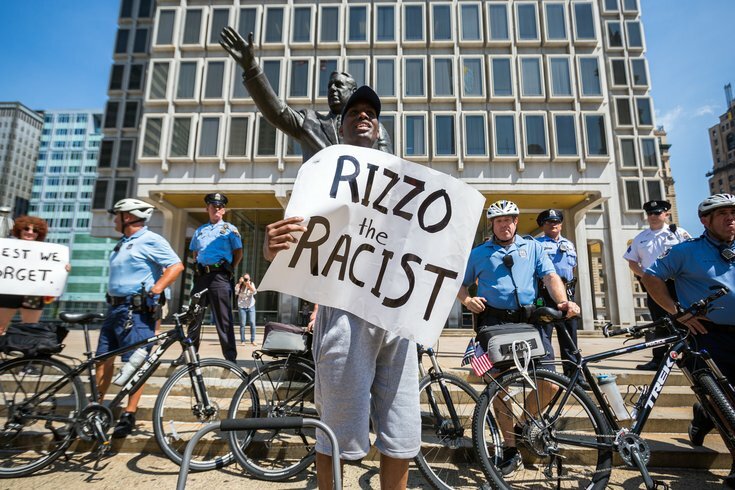 Black Lives Matter activist Asa Khalif organized the protest of the Frank Rizzo statue at Philadelphia's Municipal Services building on Friday, Aug. 12, 2016. Asa Khalif, one of the most visible faces of social justice activism in Philadelphia, will run for a seat in City Council next May. The Philadelphia native, 48, created a Facebook page for a political campaign seeking one of City Council's seven at-large seats. He formally announced his run on Facebook Live Tuesday night. Khalif has been a vocal critic of the Philadelphia Police Department's handling of several high profile shootings of young black men, most notably Brandon Tate-Brown and David Jones. Khalif also became a prominent figure in the protest movement to take down the statue of former Philadelphia Mayor Frank Rizzo at the Municipal Services Building. His Coalition 4 Black Lives and Black Lives Matter Pennsylvania are not associated with the national Black Lives Matter organization, whose local proponents have increasingly clashed with Khalif over the past year. The local Philadelphia BLM chapter, the Black and Brown Workers Collective and Philly for REAL Justice all distanced themselves from Khalif in April following the controversial arrest of two black men at a Center City Starbucks. In a series of statements, the groups claimed Khalif's actions "endangered and compromised" their efforts. Khalif's campaign is expected to focus on poverty, education and social justice.